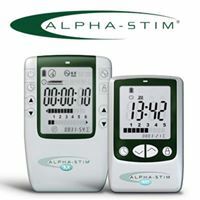 Many of my patients who have not responded favorably to prior pain control treatments are now reporting significant relief from using a small portable electronic transcranial stimulator. This unit has been FDA approved for post-operative pain, insomnia, and depression, and gently attaches to each ear lobe using small electrode clips. It generates a tiny but powerfully effective signal that also reduces anxiety and quickly stops cravings for alcohol or recreational drugs when patients are going through a supervised withdrawal program. To find out more, click here. Another electronic device we frequently use is called an interferential neurostimulator. Although it was originally invented in Germany, it was notoriously used by the Russian weight lifting athletes in the 1950s to build larger and more powerful muscles. This is now called “Russian Muscle Stimulation” and it is being used to build muscle mass not only for elite athletes but for patients with myasthenia gravis, multiple sclerosis, or other muscular degenerating conditions as well. This unit is particularly effective for alleviating muscle pain and spasms. We recommend that patients receive at least two clinical trials at our office before investing in purchasing a unit for home use, To find out more, click here. « Is Prior Trauma Still Causing You Problems? Here’s How To Find Out.